Alan Biggs at Large: Harry Maguire’s Premier League dream turned into a nightmare. What price the loyalty shown by the likes of Chris Morgan? Harry Maguire is a good deal better off than he was at this time last year. Financially, that is. In football terms, absolutely not. 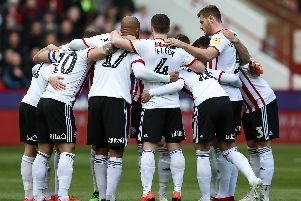 Of course, had Maguire known in advance, amid last summer’s prolonged uncertainty, that Sheffield United would miss out on promotion, the decision to press for a move would have been even easier. Jumping two divisions to the Premier League was a no-brainer, wasn’t it? Well, Maguire now has cause to reflect on the clarity of his thinking - and not only because of Hull’s relegation to the Championship, leaving these Yorkshire rivals only a division apart. Let’s look at where he is now and where perhaps he could have been. Harry’s licking his wounds, not only having dropped with Hull (for which he could hardly be blamed after only three Premier League appearances as substitute) but ending the season as an on-loan member of the Wigan side shockingly relegated to the third tier. Maguire’s stock has tumbled a long way in the ten months since a much fan-fared £2.5m transfer to the KC Stadium. But it need not have been so. The Blades never effectively replaced him. Had he remained, Nigel Clough’s team must have had a much better shot at returning to the Championship and Harry’s career would still have been on the up. Maybe Clough might have still been in situ. Of course, hindsight is a wonderful thing and, to quote another cliche, money talks. If we’re honest, how many of us would have made the same decision from the same place? So this is not a dig at the 22-year-old centre half who made 166 appearances in no time for the Blades, but a timely warning for all young players to see the longer game for the sake of their careers. It’s the Jordan Slew syndrome. Remember him, a £1m departee for Blackburn? And where is he now? At Cambridge United, where he finished last season with one goal in nine games. The strapping centre half, not blessed with pace but as commanding as any United defender of recent years, finds himself a little knocked down for size. Which is not to say he can’t rebuild his career or that there won’t be plenty of knocks at Hull’s door should they choose not to re-harness him at the lower level. You’ll be wondering the same as this column about where one of those knocks might come from. n The words “testimonial game” evoke memories of a bygone age when loyalty abounded. At 37, Chris Morgan is almost too young to remember but, from his haircut to his creased forehead, not to mention the way he played, he is a welcome throwback. It’s fitting that after 12 years with Sheffield United - as centre half, skipper, coach and twice caretaker boss - Morgs has landed a prestige pre-season game to landmark his career. The visit to Bramall Lane of Premier League Newcastle on Sunday, July 26 is testament to the respect he commands. Mind you, I’m not entirely sure the word “friendly” fits in to his vocabulary!